The IRS rules regarding a 1031 exchange permit the exchange of an investment property for another of a “like-kind.” The definition of “like-kind” is the type of investment, not the form. Rental properties of any kind can be exchanged for other rental properties or for another investment property. For example, a single-family home, held as rental property, can be exchanged for a duplex, an apartment building, or a commercial property. The benefit of conducting a 1031 exchange is that when done properly, the tax that normally would have to be paid on any profits can be deferred. A long as the property being acquired in the exchange has a purchase price and equity that is greater than the property being relinquished there is no tax on the profits until such time that the property is sold and the income is taken out. When money is taken out of a sale as income, then the long-term capital gains rate applies, which is lower than ordinary income tax rates. Both real and personal property that is used for business, such as equipment, qualifies for 1031 exchanges. Inventory held for sale does not qualify. Exchanges are not possible under IRS 1031 rules for stock, bonds, notes, shares, or other financial instruments. Additionally, a trade of an investment property for a personal residence does not qualify. Property owned in foreign countries does not qualify. Any property that is “stock-in-trade,” such as custom homes built for sale by a contractor, or fixer-uppers that are bought with the intent to repair and re-sell them do not qualify. Within 45 days from the date of closing on the sale of the property being relinquished, the investor must nominate a potential replacement property or properties. The replacement property must be acquired within 180 days of the closing on the sale of the property being relinquished. An investor participating in a 1031 exchange can identify up to three properties of any value with the intent to acquire at least one of them. More than three properties can be identified as along as the total combined value of all the properties does not exceed 200% of the value for the relinquished property. Alternatively, more than three properties can be identified with the total combined value of all the properties exceeding 200% of the value for the relinquished property, as long as 95% of the market value of all identified properties is acquired. It is possible to acquire a property before the relinquished one sells through a structure called a “reverse exchange.” An investor may acquire a property for lesser value; however, taxes will have to be paid on any money taken out. The 1031 exchange rules are complex. It is best to work with a skilled facilitator of the 1031 exchange that understands all the specific requirements. 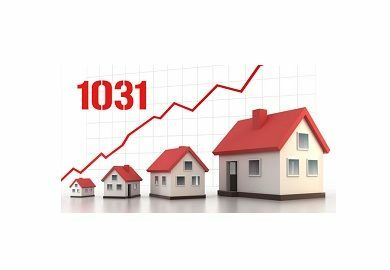 The 1031 exchange provisions are an excellent way to increase real estate values for investment property and receive the benefits of deferred payment of capital gains taxes.